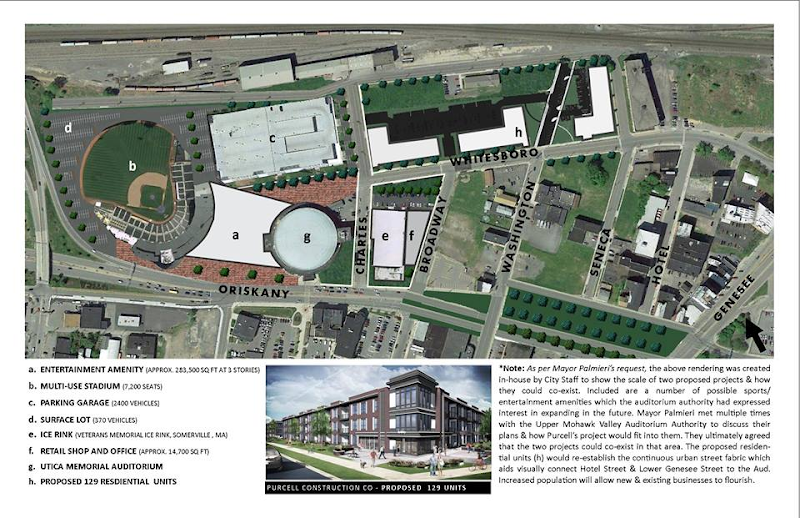 What might a combo sports facility/apartment complex on Whitesboro St. look like? The Catalyst's Facebook page contained the rendering below. It looks great! The rendering serves its purpose to demonstrate that a sports and apartment complex can co-exist on the same site. BUT there are some troubling aspects to the rendering that, if not fixed, could spell more trouble for the future City of Utica. The rendering shows more street closures that will make getting in and out of the proposed sports/apartment complex and Baggs Square West difficult. The project site can currently be accessed from the heart of Downtown via both Cornelia St. and Broadway. These streets run south all the way to Court St., which is part of a major East-West thoroughfare across town. Cornelia and Broadway also provide an important visual connection between the project site and Downtown, helpful to both drivers and walkers making their way. The site can also be reached via Washington and Seneca Sts; however, these streets, which formerly ran to Genesee, have been blocked by the Radisson and Ellen Hanna Park, and now only provide limited connectivity. The rendering shows that the segment of Cornelia north of Oriskany Blvd will be eliminated, cutting off access to the west end of Whitesboro Street and the west end of the project site. (Cornelia may also be cut off by the proposed hospital according to renderings of that project). The north ends of Broadway and Seneca Sts. are being cut off by medians or a park from those streets to the south making access to these areas from the southern direction more difficult. This will reduce access to both the project site and Baggs Square West (which is already difficult to reach because of the N. Genny bridge). It looks as though planners are depending on Washington St for site access to the south, but it's connectivity only runs to Lafayette -- and the value of that connection gets threatened if the proposed Hospital blocks Lafayette! Whether the street closures are proposed by the developers, the city, the State DOT, or all of them, they spell trouble. It is as if they are deliberately creating a maze for people to navigate through! Utica should be re-connecting its streets, not cutting them off into small isolated segments, if it wants them to be accessible for economic activity. Will the new Utica be Amazing . . . . or just a maze? P.S. Some afterthoughts . . . The connectivity problems on this rendering appear to be easily solvable by closing one block of Charles St., which has limited connectivity, switching buildings "a" with "e" and "f," re-configuring the existing connection between Cornelia and Whitesboro Sts. to give access to the proposed parking garage, and maintaining the existing connections of Broadway and Seneca.
") and let the developers use THEIR creativity, instead of the government involving itself with the intricacies of a design? The less government needs to be involved, the more developers will be encouraged to come to town. "Freedom" (within an ordered structure) sells!